Constructed from durable injection molded thermoplastic. There are 2 steel reinforcements in the 2" thick top shelf for extra strength. (32" x 24" models only). Shelves feature a 1/4" retaining lip. 3-outlet UL/CSA approved electrical assembly. 24" x 32" three shelf models hold up to 400 lbs. of evenly distributed weight. Four 4" casters, 2 with locks. HWTV28 & HWPTV28 models have 2 shelves, all others have 3. Includes the HWPSMS20 universal, all steel plasma stand that attaches to the top shelf of these mobile carts. 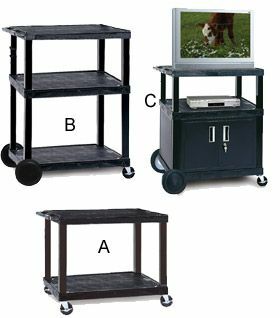 The Plasma Stand carts hold up to a 48" plasma/LCD TV. FOB Shipping Point. Product No. Ltr. No. Size H x W x D Cabinet Wt. (lbs.) Price Ea.